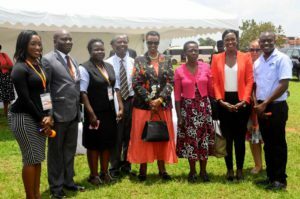 First Lady Janet Museveni on Thursday launched the 2017 Africa Debate Championships at Mengo SS in Kampala. The championship, the first of its kind, is being sponsored by Stanbic Bank Uganda and other development partners. The event that has attracted schools from across the continent aims at sharing knowledge and forging partnerships among the participating schools. The debate is in line with the bank’s continued commitment to support and transform the lives of people through the bank’s Corporate Social Investments (CSI) programmes. “However, there are skills that are not easily taught and grasped in the classroom environment, yet such skills are vital in preparing the student to compete successfully in the world beyond the classroom. Competitive debate teaches these extremely valuable skills,” she added. Several schools from Kenya, Rwanda, South Africa, South Sudan, Tanzania, Zimbabwe and the host Uganda will participate in the competitions. Cathy Adengo, the Stanbic Bank communications officer, reaffirmed Stanbic’s commitment to transforming lives of its customers through corporate social investments in education. “The private sector has a key role to play in supporting the achievements of the nation’s development priorities, of which, education is a critical pillar. As key sponsors and partners in this initiative, our aim is to continue to create and be a part of key interventions that will promote and advance the achievement of our education goals,” Adengo said. Ugandan schools participating include Lubiri Secondary School, Kiira College Butiki, St Jerome SS Ndama Rukungiri, Bukinda Seminary, Katikamu Secondary School, Uganda Martyrs High School Lubaga, St. Henry’s College Kitovu, Kings College Buddo and Mengo Senior School. Others are WATOTO, Bishop CyprianoKihangire, Ntare School, Gayaza High School, Nyakasura School, NdejjeSeconadry School and Kitante Hill School.